When you go to a new country, chances are that you will want to indulge in the food and drink it has to offer. It is no secret that Greek food is tasty. 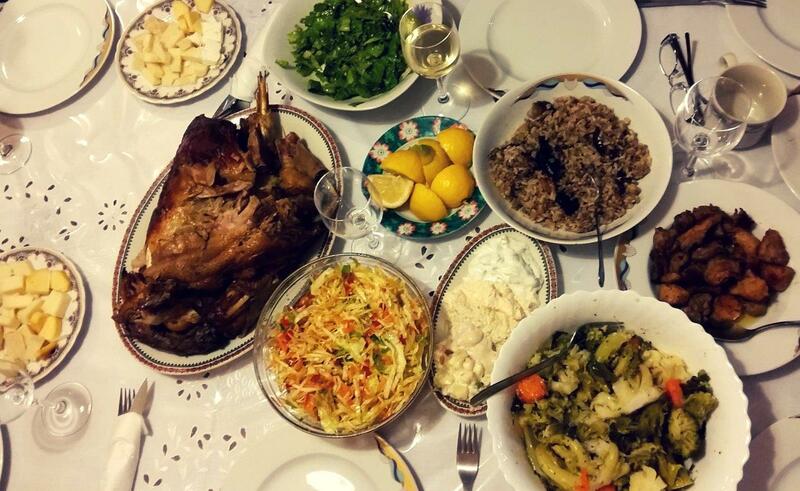 What visitors often miss, however, is the abundance of small things that define Greek food. Read on to learn more about the dishes and ingredients we consider to be the most important! Occasionally, it may contain capers and, in some areas of Greece, lettuce. Some people add vinegar too, but we think tomatoes and vinegar don’t go that well together. In recent years, more gourmet versions of the Greek salad have appeared in several restaurants in Greece. Herbs like parsley and basil, and other ingredients like rusks, yellow tomatoes or pickled peppers are added. While we can’t argue with top chefs in Greece, we are advocates of the more traditional version. We strongly believe that nothing can compare with a real Greek salad, served with lots of fresh bread to soak up the olive oil. While the latter might not be considered entirely good manners, it is definitely worth trying. 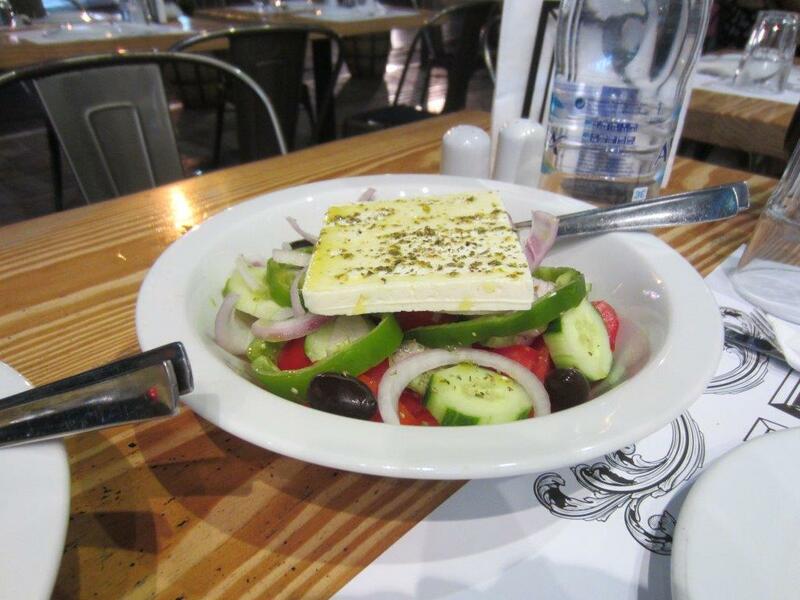 We prefer to have our Greek salad by the sea, possibly with a glass of beer of ouzo! 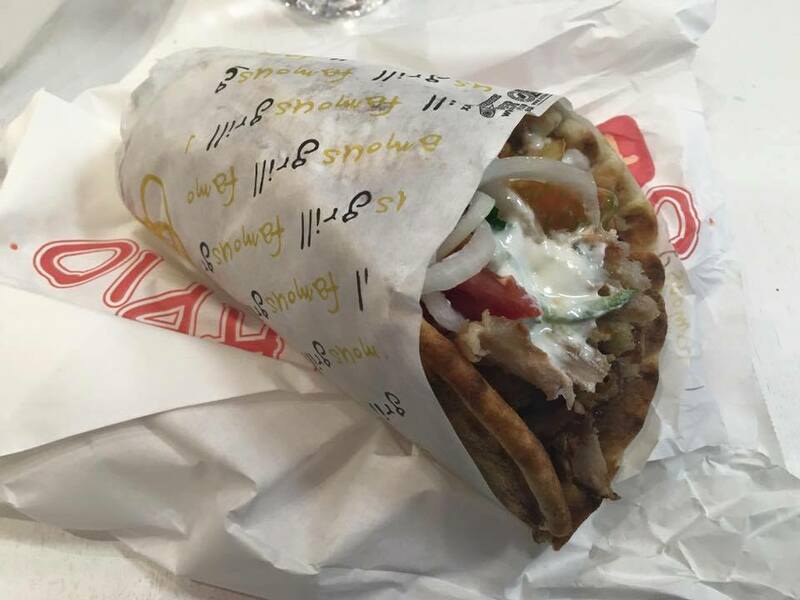 A souvlaki consists of small pieces of meat (generally pork or chicken, and less often lamb or beef) on a stick. Gyros, on the other hand, is meat (mostly pork, chicken or lamb) grilled on a big spinning vertical rotisserie. Both can either be eaten on a plate, or wrapped in a pita bread, with fries, tomatoes, lettuce, onion and tzatziki, a thick sauce made out of yogurt, cucumber and garlic. In some places, you can also get vegetarian versions of the above, with mushrooms or cheese instead of meat. When those are not available, you can always have a vegetarian version without any meat. The choice is yours! One of Vanessa’s favourite childhood memories, was getting a fresh loaf of bread from the bakery. At that time, there was probably only one type of bread – white, fluffy and very chewy. It was very difficult to resist having the crusty end of the bread before even getting home! All Greek food is accompanied with bread, which is often used to soak up the delicious sauces. 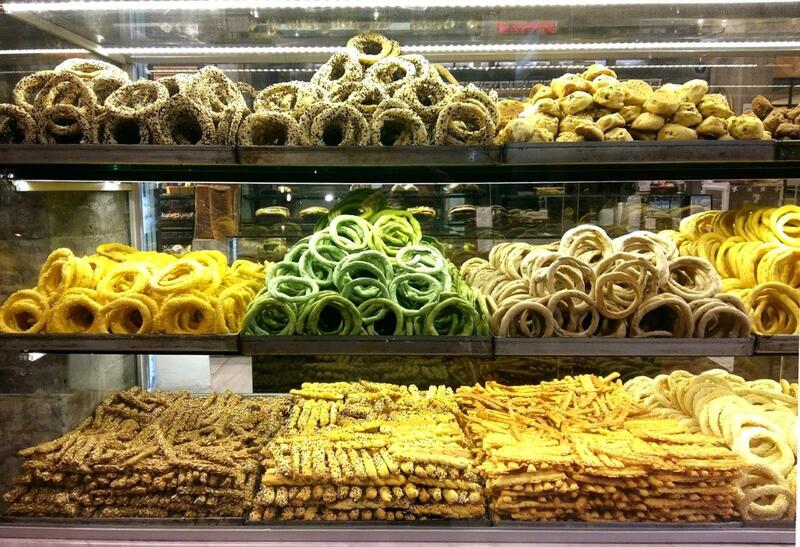 Voutimata and koulourakia – various types of cookies with different flavours such as chocolate, cinammon, orange etc. You can also find all sorts of cakes and many other yummy snacks. We just hope you are not sensitive to gluten! Possibly our favourite bakery snack is the koulouri, a round, bread-like snack covered in sesame seeds. 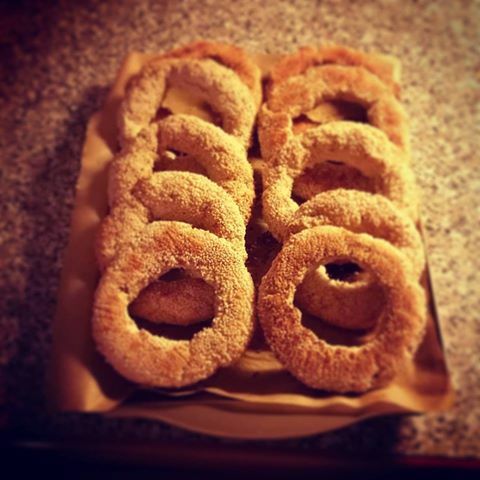 The koulouri is really popular and you can also get it on the street. A plain koulouri costs between 30 and 60 cents. 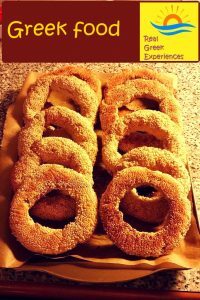 You can probably find the best Greek koulouri in Thessaloniki. In Athens, the most famous place to get a koulouri is “To koulouri tou Psirri“, at Karaiskaki 23, close to Monastiraki metro. Tip – they are open 24/7! We also adore Koulourades in Pireaus. These guys can add more ingredients in their freshly-made koulouri, like Philadelphia cheese. Opening times – 6.00-15.00 on weekdays, 6.00-14.00 on Saturdays. Don’t get discouraged by the queue! One of the most famous types of Greek food, is Greek yogurt. You might have even tried it in your own country. “I really like Greek yogurt”, we hear you say, and we can’t agree more! But we probably have a slightly different thing in mind. Real Greek yogurt is made of either cow’s, sheep’s or goat’s milk and it has a thick creamy layer on top. Its fat content is roughly between 4 and 6,5%, it has no added sugar and it’s actually a little sour in taste! 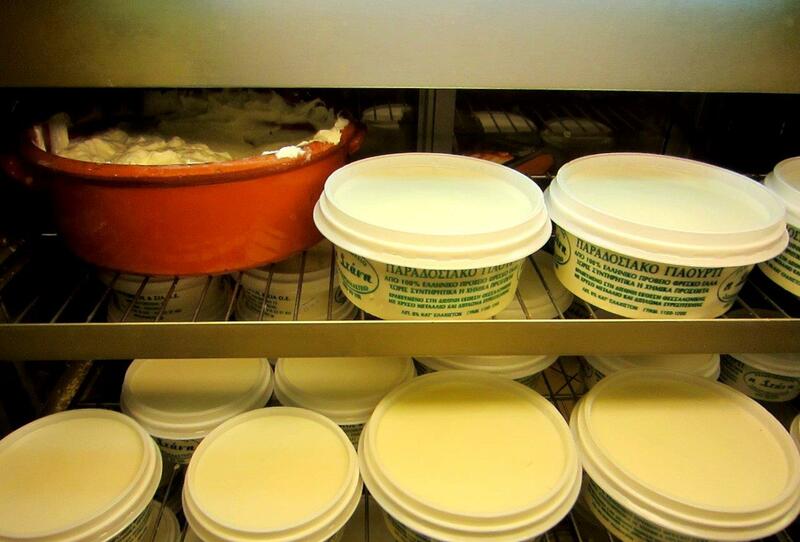 Real Greek yogurt comes in either a plastic pot, or a claypot. You can get it at most supermarkets and food markets. If you are in Athens, we recommend Stani, near Omonoia metro, where you can have your yogurt with honey and walnuts. Apart from feta, however, Greece has an abundance of different types of white and yellow cheeses, made from cow’s, goat’s and sheep’s milk, or their combinations. In our (biased) opinion, although Greek cheeses are nowhere near as famous as their French, Italian and Dutch counterparts, they are equally tasty. 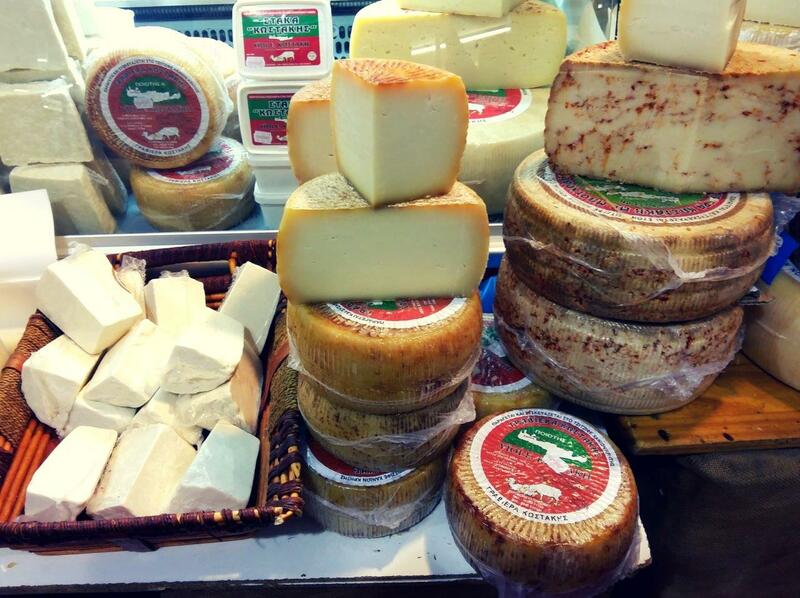 Cheeses like kaseri, graviera Kritis, katiki, kefalograviera, ksinomizithra and metsovone must simply be savoured! 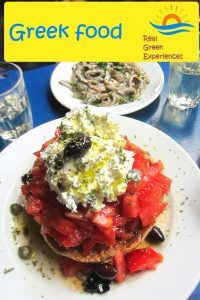 The best place to taste Greek cheeses is any food market that offers cheeses, or any large supermarket where you can get cheeses over the counter. If you are in Athens, you can also try the shops around the food market on Athinas street. In many places, there are also specialised cheese shops. Yum! If you are a meat lover, you are in the right country. Apart from souvlaki and gyros, which most visitors seem to adore, there are plenty of other meat-based dishes, grilled, stewed or cooked in the oven. 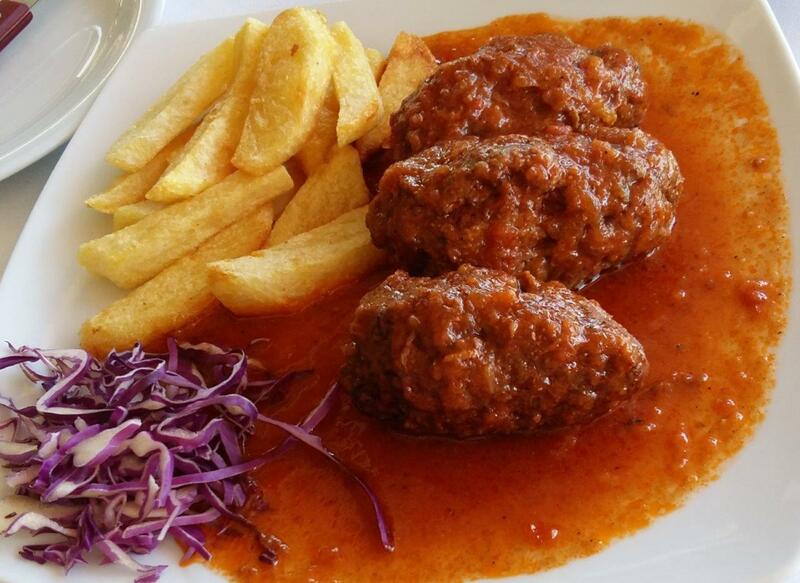 Greek meat dishes worth looking out for are stifado, a slow cooked stew with lots of onions, kokkinisto, meat cooked in tomato sauce, lemonato, meat cooked in lemon sauce, and soutzoukakia, meat patties with an aromatic red sauce. If you are feeling adventurous, there is a lot more. Dishes with obscure names like kokoretsi and gardoumpa might not be an everyday snack, but meat lovers should definitely go for them. They are made out of the inside parts of lamb or other animals, and you will either love them or hate them. A soup made out of similarly obscure ingredients, named magiritsa, is traditionally served after midnight on Good Saturday. You might also want to try patsas, a thick soup containing animal parts that are probably banned in several European countries. This working-class dish has been described as a cure for a hangover, and is definitely not light on the stomach. Even if fish and seafood are not part of your diet, chances are you will come across restaurants serving mostly fish and seafood dishes. We totally suggest that you try them out! 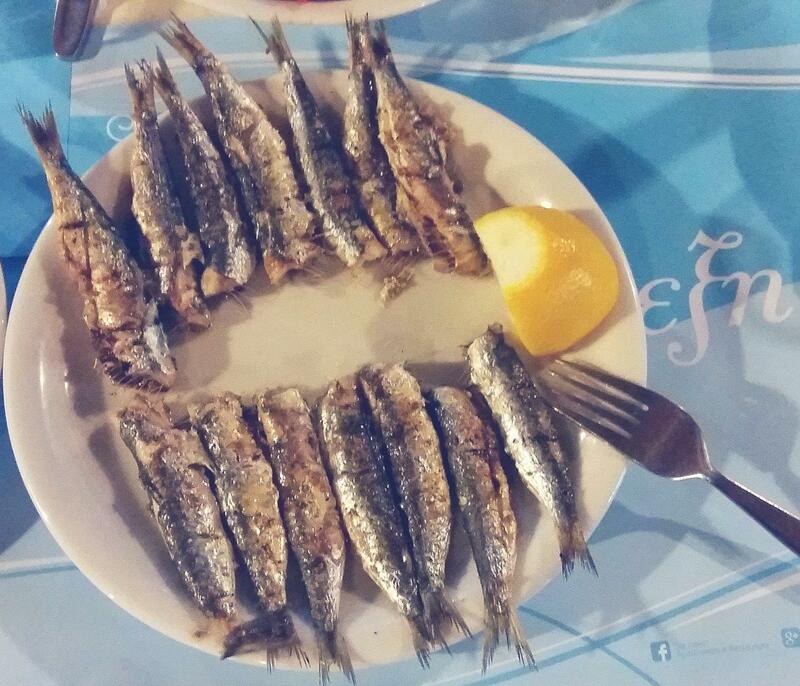 In general, the smaller the fish, the lower the price, and small fishes like grilled sardines or gavros are extremely popular. Don’t hesitate to be a little adventurous and try seafood-based dishes, such as grilled octopus, garides saganaki (shrimps cooked in red sauce and feta) and fried kalamarakia. Greece is definitely not a tropical country, but it is one of Europe’s most southern countries. As a result, most fruits and vegetables in Greece are really tasty! They are also a lot cheaper than in many other European countries. Fruits like cherries, apricots, peaches, watermelons, grapes and oranges are a staple in a Greek diet. Apart from fruit, we enjoy many fresh vegetables, like tomatoes and cucumbers. 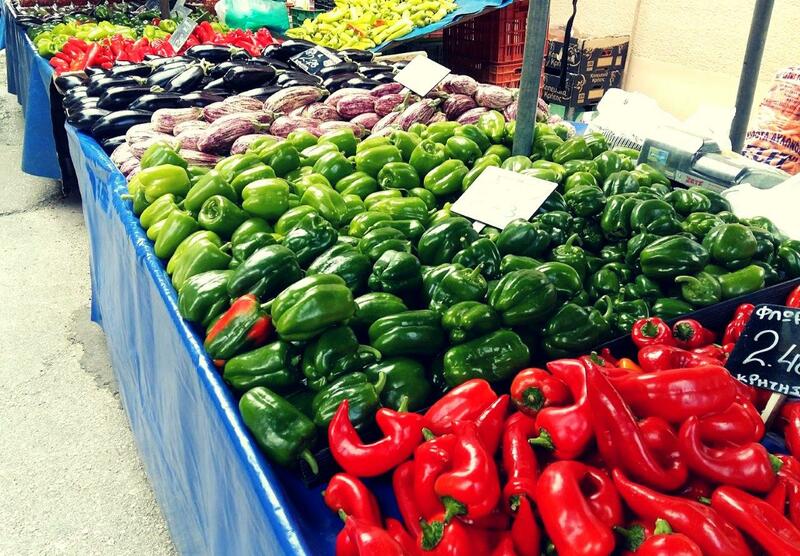 To get fresh fruit and veg while in Greece, we suggest avoiding supermarkets and going to street markets instead. If you are in Athens, by all means visit the big food market on Athinas street. You won’t regret it! Vegetarians will be happy to know that there are plenty of Greek dishes based on zucchinis, aubergines, carrots, peppers, spinach, leeks, potatoes, onions, tomatoes, and all sorts of beans. This might be the reason why vegetarian restaurants are still scarce around the country. So, if you are a vegetarian, your best bet is to go to a local taverna and ask for the vegetarian dishes of the day. You will be surprised with the variety! We’ll be very happy to answer any questions you have about Greek food! Just leave us your comment below!